The office of Rep. Cathy McMorris Rodgers (R., Wash.) says organizers of a local Women's March backed out of an agreement to play a message she recorded after learning she was unable to attend due to the government shutdown, according to the local Spokesman-Review. McMorris Rodgers had planned to attend the Women’s Persistence March, which was supposed to feature a speech by both the congresswoman and Lisa Brown, the Democrat running to unseat her. Brown attended, but McMorris Rodgers was held in Washington, D.C., to vote on legislation to fund the federal government. 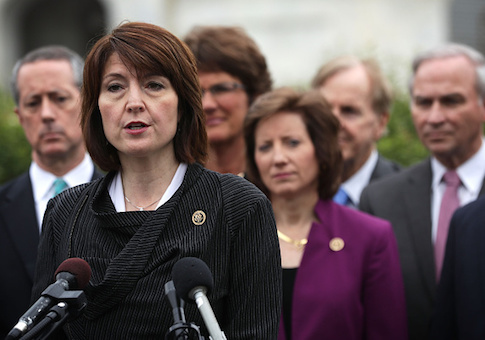 Event organizers had initially told McMorris Rodgers, the highest ranking Republican woman in Congress, they would play a video message she recorded for the event. After the video was sent on Friday, however, the organizers told her office a "video wouldn’t work" and she "would need to be there in person." The video message, which was provided to the Spokesman-Review and can be viewed below, is on her ability to "work in a male-dominated field." "I wish I was able to join you for the 2018 Women’s March in Spokane," McMorris Rodgers says, without knowing that her invitation would later be revoked. "I appreciate you allowing me to be a part of this event." "If you would have told me as a little girl, picking fruit on our orchard, that I would one day be elected as the 200th women ever to serve in the United States House of Representatives, and to be the only women to give birth three times while serving in office, I wouldn’t have thought it possible," she says. "It’s true that I work in a male-dominated field, like many women in this country. And that’s why it is crucial that we do our part as women to be role models, to encourage women in our community to be bold, to strive, to fulfill their dreams, and to be positive disruptors." This entry was posted in Politics and tagged Cathy McMorris Rodgers, Women's March. Bookmark the permalink.